Philadelphia newschannel NBC 10 has taken the step of adopting the geo-location app Foursquare in order to integrate with viewers more dynamically. The station has created an account that currently has a few hundred followers, and one reporter per day will be assigned to the account. NBC 10 reporters will check-in on location, and update stories through Foursquare to followers as events develop. Eventually, the station will roll out the feature for several news stories each day and implement individual reporter accounts to increase NBC 10’s reach on Foursquare. 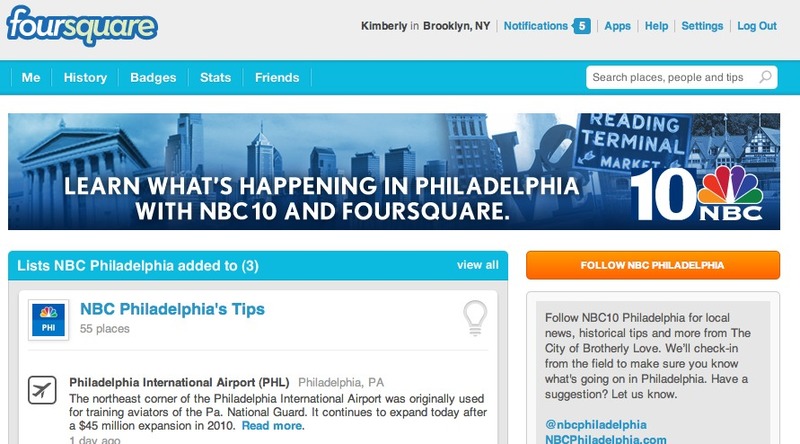 So far, NBC 10 has added 5 check-ins and 55 tips in Philadelphia to their Foursquare page. While the reach is limited, particularly without Facebook and Twitter integration, the widespread adoption of the use of location-aware apps by local news stations could add a very youth-friendly aspect to the traditionally drier and tech-resistant local news vertical.